One of the things that is different about Tibet is the distances. 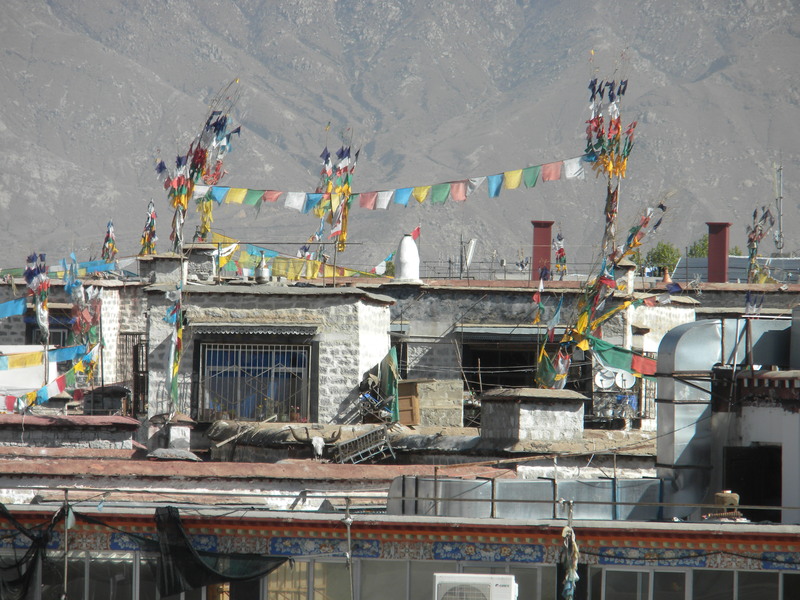 Lhasa has a population of 400,000, small by Chinese standards. This morning we drove from our hotel to the main town square. It took 15 minutes, not the hour it would have taken in Beijing. In taking this photo, Robin inadvertently included three policemen. Photographing the police or soldiers is verboten, but fortunately no one noticed. The police and military presence was even more obvious in the square, the site of many protests, including self-immolations, against the Chinese occupation of Tibet. At one time, the presence was even more obvious, with snipers on the rooftops. We were advised that we could take any photos we wanted except photos of the police or soldiers. Robin took one anyway, inadvertently, but no one noticed. 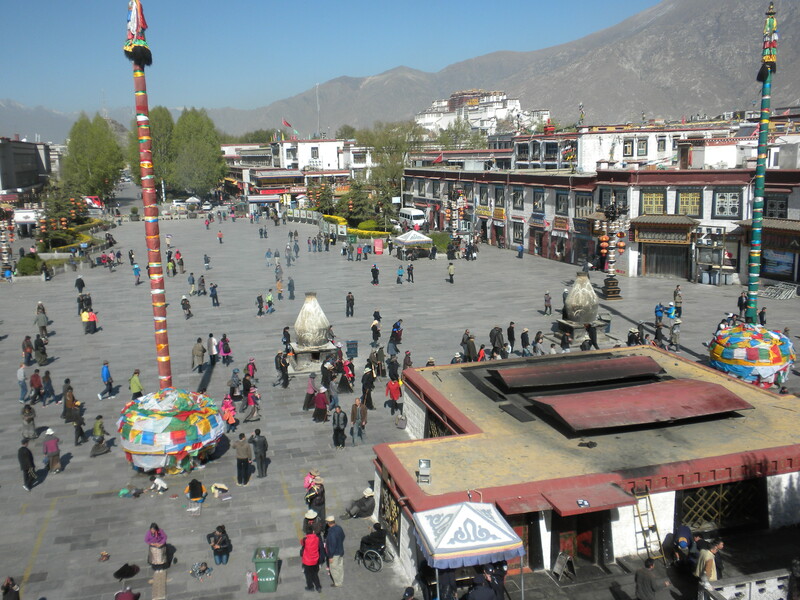 On the square is the Jokhang Temple, the main Buddhist temple in Lhasa. Built in the 7th century, it was sacked in 1966, during the Cultural Revolution, and thousands of Buddhist artifacts were destroyed. The temple survived, however, and remains a place to which many pilgrims come. They were outside the temple, some prostrating themselves and some making a circuit around the building. There were two lines to get into the temple, one for pilgrims and one for tourists. 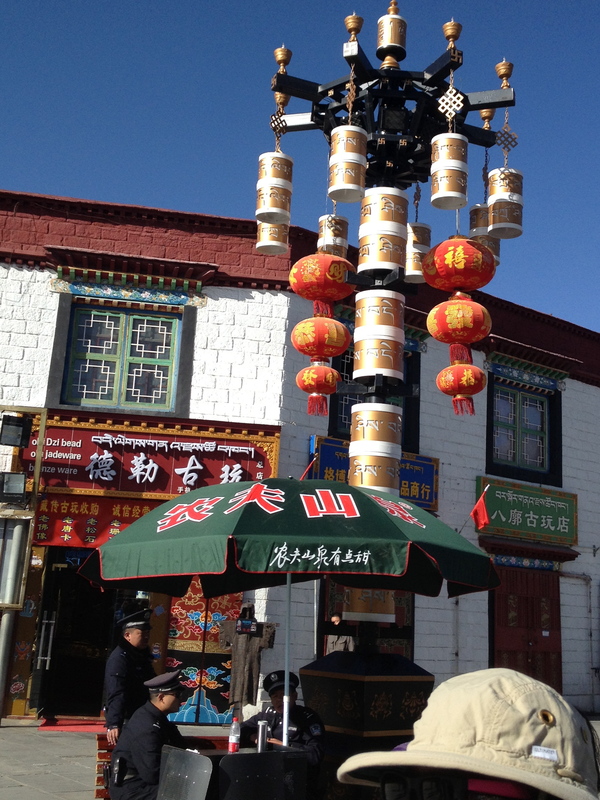 It was the one place in Lhasa that seemed to offer crowds like those in China. One pilgrim had his iPhone out, taking pictures of the tourists. It was a crunch to get through the narrow opening. At one point, someone shoved me from behind. I turned around and saw it was a monk. Once inside, it was not so crowded, but photos were not allowed. 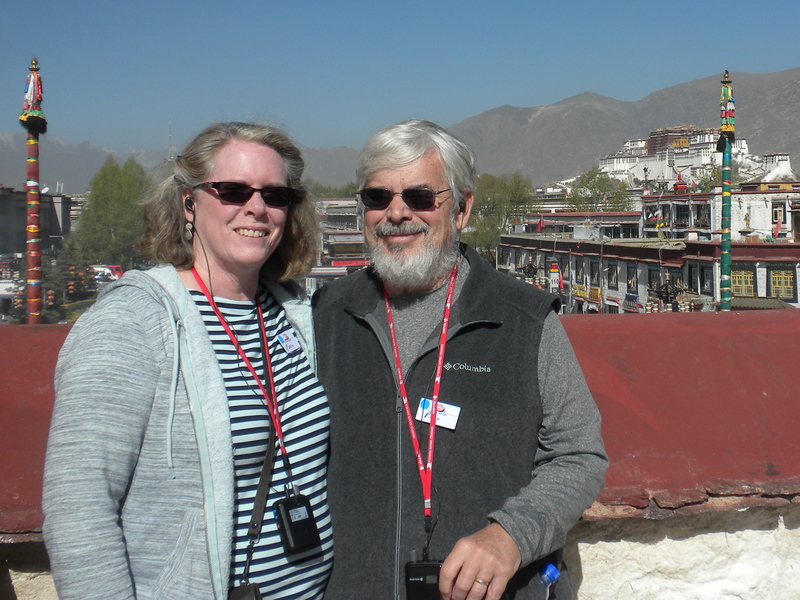 We climbed up to the roof, which offered terrific views of the square, the mountains, and the Potala Palace, traditional home of the Dalai Lama. We had lunch at a restaurant just across the street from the square. As were eating, several Buddhist monks took our photographs until our waitress shooed them away. We learned later that these were monks from rural parts of Tibet who had probably never seen Westerners. In the afternoon, we went to the Sera Monastery, where Buddhist monks are still trained, At its height, the monastery had 6,000 monks in residence. Today there are about 300. 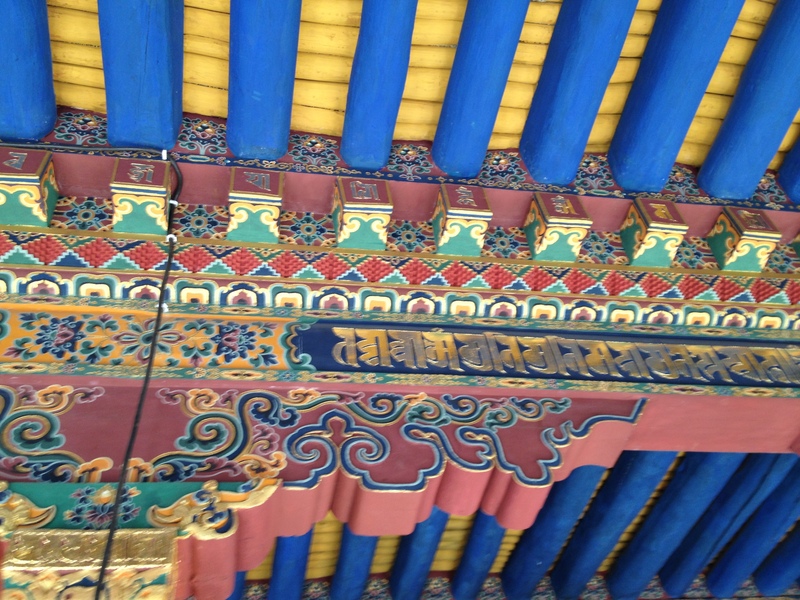 The monastery was badly damaged during the uprising against Chinese rule in 1959 and many monks fled or were killed. 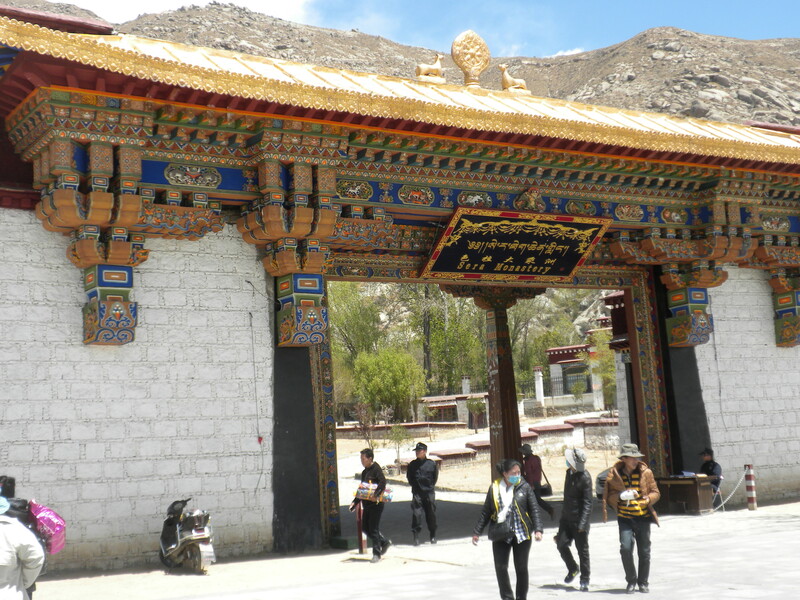 In addition, Wang Dui said that at one time being trained as a monk was the only way to get an education in Tibet. Today there are schools and becoming a monk is less popular. 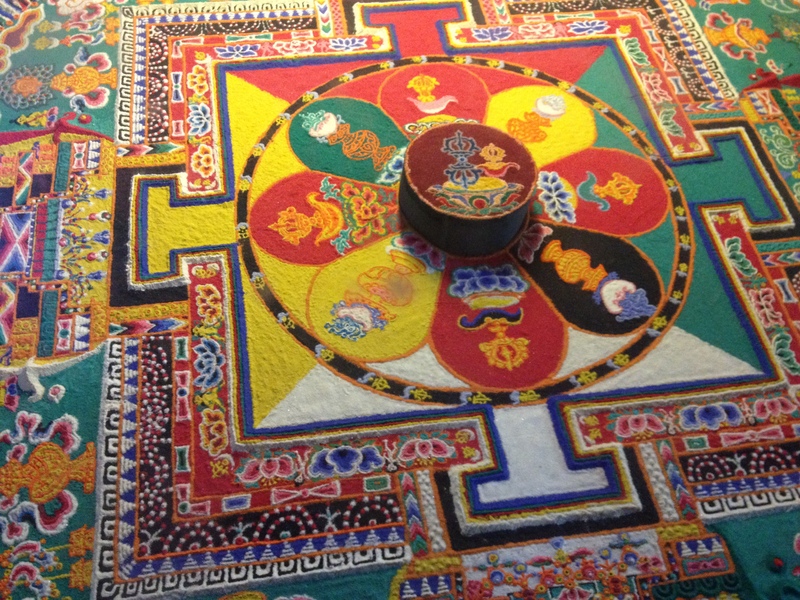 One room at the monastery contained several mandalas created in sand. They were quite beautiful. The monastery is perhaps best known for its debates. In the afternoon, the monks gather in the debating courtyard. They pair up, one monk standing and one seated. The standing monk harangues the seated one with much pointing and clapping of hands. The seated one then responds. We had no idea what they were saying, of course, but it was still fascinating to watch: https://youtu.be/5z6wPQ3nZD4 We also visited a Tibetan home. This house was larger than the one we visited in Beijing, housing three generations of a family. Even so, it seemed cramped by American standards and was full of Buddhist artifacts. One room was a shrine, which is common in Buddhist homes. The shrine contained something unusual, a photo of the current Dalai Lama, which is generally not allowed. The photo was permitted because it was the lama as a young man, meeting with Mao, probably in 1954. At the home we sampled yak butter tea, which tastes like tea with butter in it, as you would expect. In the evening we were treated to a short performance of Tibetan singing and dancing at dinner. 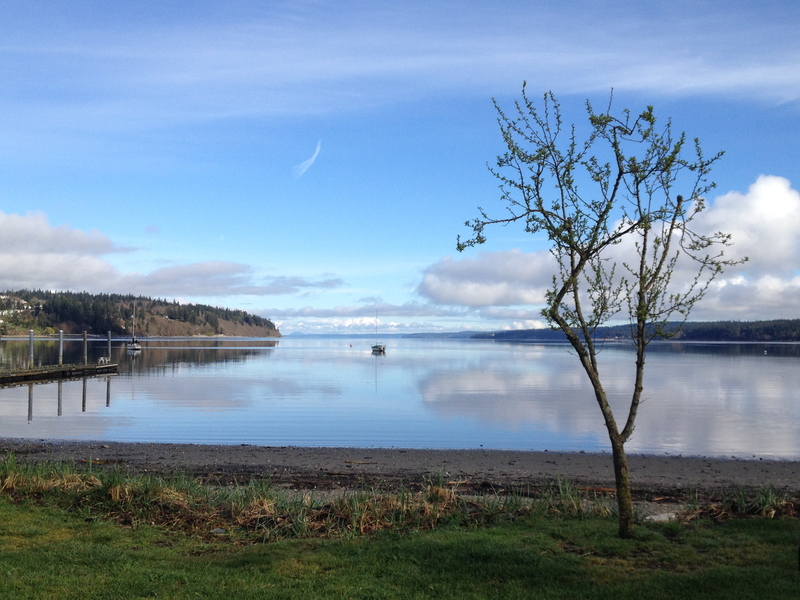 It was not as elaborate as what we had seen in Beijing, but in some ways it was more fun. Some members of our group even joined in the final dance, which featured two dancers in a yak costume. Tomorrow would come the main event, the ascent of the Potala Palace. Can’t wait to read more! Mark said he going to wait and binge read the whole trip when you are done.